Jayne asked: do you know of any free audiobooks? If you're looking for free audio books, the web is the best place to find them. There are plenty of sites offering free audio books in the public domain, read by very talented narrators - start here. ❧ Amazon.com has a audiobook section - and they are offering two free audiobooks if you join! ❧ LibriVox provides free audiobooks from the public domain. ❧ 224 Places For Free Audio Books Online. ❧ The Library audio book services are provided by OverDrive nationwide. 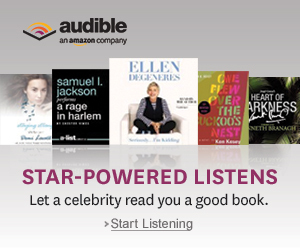 Audible, an Amazon company, offers the world's largest selection of digital audiobooks and spoken word content. You can listen anytime and anywhere to professionally-narrated audiobooks across a wide range of genres, including best sellers, new releases, sci fi, romances, classics, and more. • Get two free audiobooks to start!